There are a few unusual fasteners used in every car. I discovered recently, in a random post on the Studebaker Drivers Club Forums, that the starter bolts on Studes are a special part rather than an off-the-shelf fastener. The factory bolt, p/n 529367, is a special one with an unusually long collar section. The reason for this is that the long collar goes completely through the starter flange and the transmission bellhousing, keeping the two in alignment and protecting the Bendix drive gear from improperly engaging the ring gear (which could chew up both gearsets); a standard bolt's threads have a smaller diameter than the collar and allow the starter to become misaligned. Unfortunately, dumb auto shops through the years paid no attention to this and just used whatever bolt was lying around handy. 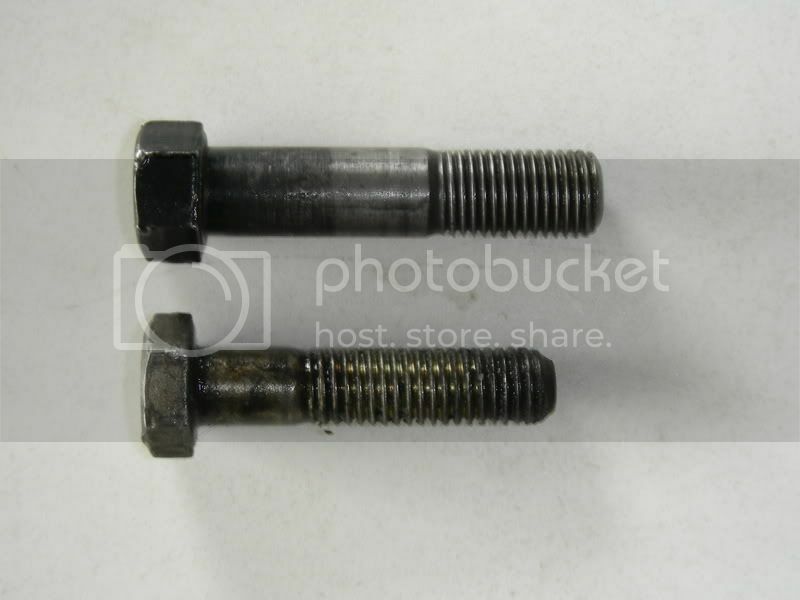 The photo shows the difference between the special Stude bolt and a standard fastener. (The upper bolt is the Stude part.) First you spot the difference in length; the Studebaker part is a good 1/4" longer. Notice the difference in the collar length? The Stude bolt's collar is a good inch long, where the standard bolt quits at about 1/2". Finally, the Studebaker part uses fine-pitch threads, where the aftermarket bit was coarse thread. Of course, these special bolts are long out of the parts bins. Luckily, I got a set from Rich Gahlbeck at Studebakers Northwest. Try your friendly Studebaker vendors; they'll likely be able to track you down a set, too. Remember, the difference is in the details! Do it right and you won't have trouble. Per a post by Rich Gahlbeck on the SDC forum, the bolts for V8 Studebaker automobiles are 1 15/16" long, with a shoulder of 1 1/8" (if you're trying to source them, this may help). Read the whole post here. I got a little bit ahead of myself today. Had a few moments to spare and thought I'd install the new/used factory ignition switch I had re-keyed. Got under the dash and realized: hey! I have to re-wire the entire car anyway! Why the hell am I messing with an ignition switch? But while I was under there I found that one of the terminals on the generic switch that was in there was rusted. How does that happen? Well, there's other rust under there. The steering wheel firewall collar is rusted, as is some of the dash framing. Now, the windshield has a non-standard stainless molding over the stock rubber gasket. And there's new windlace between the windshield and dash. This all leads me to believe that there was a cowl leak at one time. And there's your rust. Oh, see that bundle of crappy wiring in the photo? That's one reason I have to rewire the car. None of that should be like that. 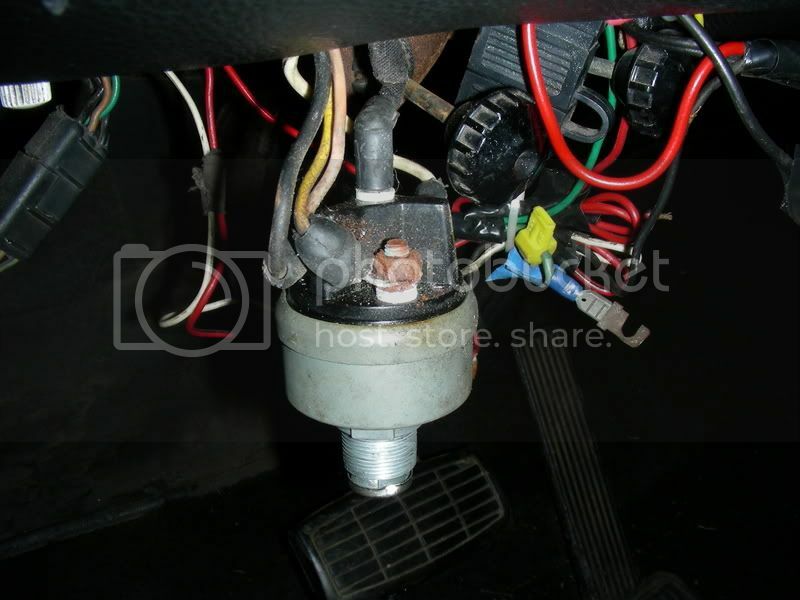 And I found out why my high-beams won't switch on: there's no wiring running to the floor switch. At all. Gone. Dunno where. If you're a Studebaker driver, sooner or later you're going to have to remove the rear hubs to service the brakes. Studes until 1965 had tapered axles, so a hub puller is needed to remove them - a time-consuming, frustrating process, but certainly do-able. A bigger problem comes when you need to separate the hubs from the brake drums. Stude rear drums are mounted to the hubs with a process called "swedging." The wheel studs are pressed into the hub flange, passed through the brake drum, and then the metal around the base of the stud is distorted with a punch to lock the hub and drum together. So how do you get the two apart? Well, you can beat on the studs with a BFH. But you risk distorting or breaking the drums, which have a wall thickness of only about 1/8". What you need is a swedge cutter. This tool is kind of like the illegitimate son of a hole-saw and and a deep-well socket. You chuck it into your drill and fit it over the wheel stud; you can then saw off the swedged metal at the base of the stud without damaging the brake drum. A good source for these is Goodson Tools. They come in three sizes, depending on the diameter of your studs: 7/16", 1/2" and 9/16". Goodson carries all three sizes; use their search box to find tool numbers ST-437, ST-500 and ST-562, respectively. Be warned that at around $65 each, these aren't cheap. But they're cheaper than trying to hunt down a new drum because you morked up your old ones! "Always use the right tool for the job," my daddy used to say. Well, the passenger's side is now apart, although it was a little more effort than the driver's side. For some reason, the steering knuckle lower support didn't want to release when I removed the bottom kingpin nut. Jacked it and let off a few times; the support would slip down about an inch and stop. I wound up having to unbolt the upper A-arm from the frame and peel it off like the Shop Manual says, but I was sweating and praying the whole time, with only the floor jack under the A-arm to keep the spring compressed. When I finally got the A-arm disconnected from the frame, the car jumped about an inch and scared the heck out of me. Good thing there was a safety chain in place! The passenger's side was worse than the driver's side. One of the upper inner pin bushings is completely gone; this is the one that the engine was resting on because of the collapsed motor mount. The rubber is non-existent, and the metal shell is egg-shaped and cracked. 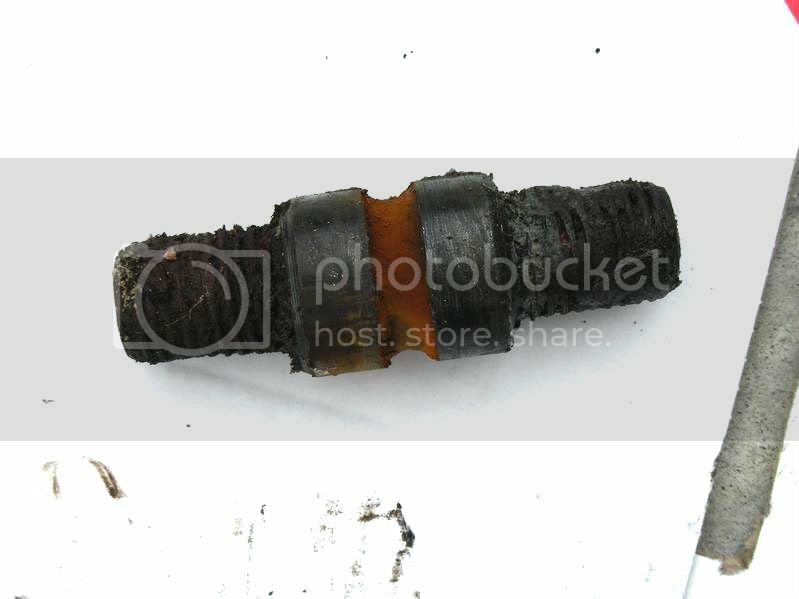 The upper outer pin had rust in the groove that the camber/caster adjusting pinch bolt goes through, and one of the upper pin bushings was seized and rusty inside, the same way one of the lowers was on the driver's side. Ugh. And of course there was three pounds of dirt covering everything. After I got the A-arms off the frame, I started to remove the steering bellcrank center pin, but my pickle fork could not budge one of the tie rods, or get the reach rod off the bellcrank. 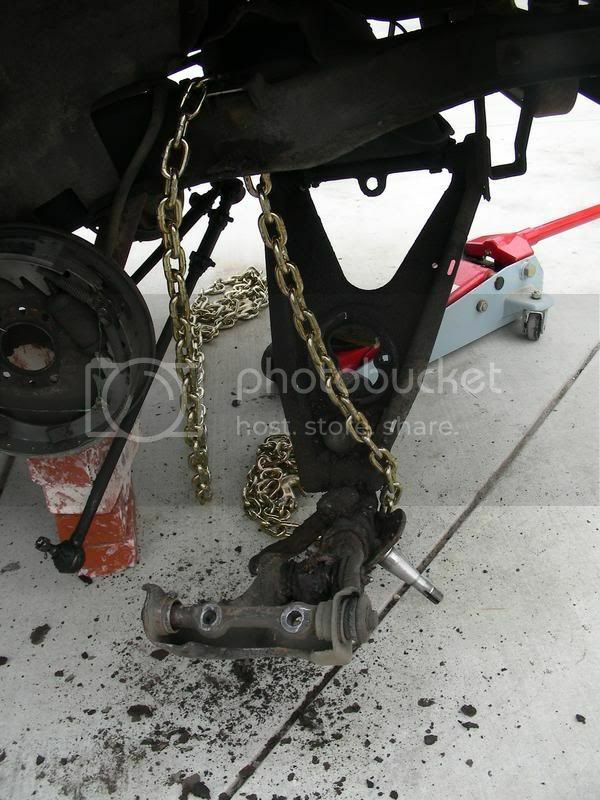 I'm going to go out tomorrow and buy a proper tie rod puller - that oughta get 'em off. I figure I have about an hour more of work ahead of me.